Like everyone else, I love weekends! Part of what makes the weekends so enjoyable is jumping into the baby pool at Goldfish Swim School with my toddler and all the other fun loving dads. I keep reading online about how much more involved dads of this generation are with their child’s development than dads of previous generations. I can’t think of any place where this is better illustrated than Saturday morning swimming lessons at Goldfish Swim School. 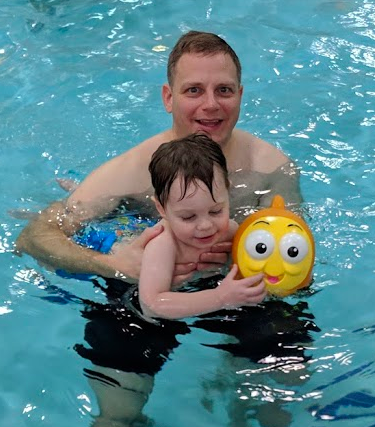 The baby and toddler classes require a parent in the pool with the child (obviously) and on Saturdays, these parents are predominately my fellow bad-joke-loving daddies (mommies welcome too, but there’s a weekend trend toward dads). We navigate through the curriculum and exercises while sharing fantasy football insights, sporting news and ‘dad jokes’ so horrendous that they make the poor instructor cringe. There is no place I’d rather be Saturday mornings than in the water with my favorite little sidekick and my bad-joking-sharing Daddy Fraternity! The 30 minute classes devolve into half hour wet daddy playdates and we wouldn’t have it any other way! Join us for a class to see what I mean and bring your best “Dad Joke!” I promise you won’t be disappointed! Contact Cathrine or Renee at Goldfish Swim School Farmington Hills and tell them Geeky Daddy sent you! What a sweet post! I used to be a swim instructor for little kids and it was blast! Love that they have the parents so involved in this – fun for both of you! That’s great that there are so many daddies spending time with their little ones. This is great for the kiddos. Looks like you guys are having lots of fun too. How awesome! I think it’s great to have that daddy and me time with your little one! And that’s exciting that its predominately dads! Looks like so much fun! That looks like fun! I love when I see dads interacting with their kiddos in such a fun way! I think you’re absolutely right. Dads are much more present now. When I was a kid in the 90s, my dad was a stay-at-home dad while mom worked, and I know that really wasn’t normal at the time. I wish we went swimming more though, because that is (still) one of my fave activities! That is amazing to have a Saturday where the dads take their little ones to swim classes. The bonding that goes one when parents do things like this is priceless! First off “Dad Jokes” are the best!! I think it is amazing more dads are getting involved with their kids!! This swim class looks like both the parents and the kids are having a blast!